Full mouth restoration or full mouth reconstruction will help strengthen your teeth and prevent problems that go along with weak and brittle teeth. Some problems that arise could be a sore jaw, headaches and overall pain and discomfort. Teeth become discolored overtime and may lose their functionality, making it hard to chew as well as you used to. Tooth discoloration is bound to happen as we age, so dental care is essential to prevent any damage. If you notice that your teeth are not as strong as they used to be, you may consider a dental full mouth reconstruction. 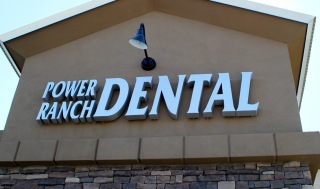 If you have further questions about your teeth, or would like to set up a free consultation, give Power Ranch Dental a call at (480) 988- 2282. We can show you different full mouth reconstruction cases that we have done and get you started with different treatment options. Contact our office today! We look forward to meeting you and helping with your smile!